24 years ago my memories of Chilas are of unending barren vistas and heat. Post Besham and Dasu, once you cross into Diamer you can immediately see the transition. Green moss and tree covered mountains transitioning into iron rich cliff faces varying across shades of brown. Patchy dull green scrub spotting landscape that minutes ago was a bright emerald green. The bridge at Harban Shah checkpost, An hour before Chilas. Less than an hour after Chilas you will see an aged arch bridge connecting two opposite cliff faces. The bridge is at Raikot. On your end coming from Chilas is the rough road waiting to be paved and surfaced. It is the road that has jolted you to your bones over the last five hours. On the other is the smooth paved highway finished in 2013 that drivers describe as driving on silk and mirrors. 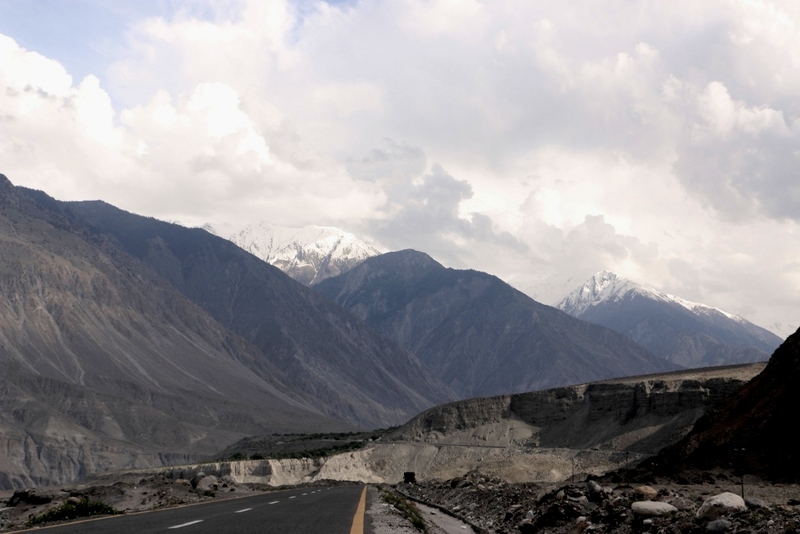 The new Pak China high way goes all the way to Khunjarab pass via Gilgit and Hunza. With the exception of a 14 kilometer break in between at the Atabad lake where the road has been submerged, the dual lane road immediately makes it presence felt. Jaring shocks are replaced by the smooth hum of your van’s engine as the weary driver finally breaks free and pushes speed all the way upto 90 km an hour. The new shiny metaled road. Dual carriage highway that goes all the way to Khunjarab pass. Its like driving on Sheeshah, says Farooq, our driver. 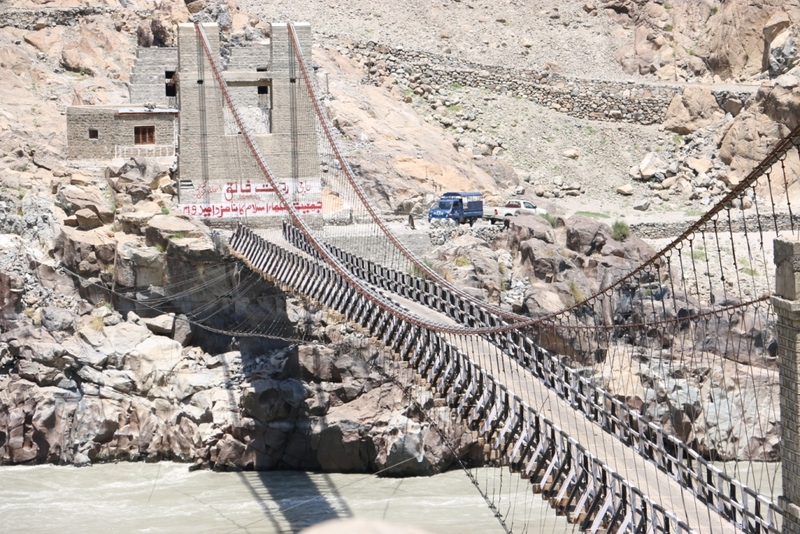 While Chilas is now officially part of Gilgit Baltistan, it is at Raikot bridge the security threat ends. You are now officially across the old border between Gilgit and Kohistan. 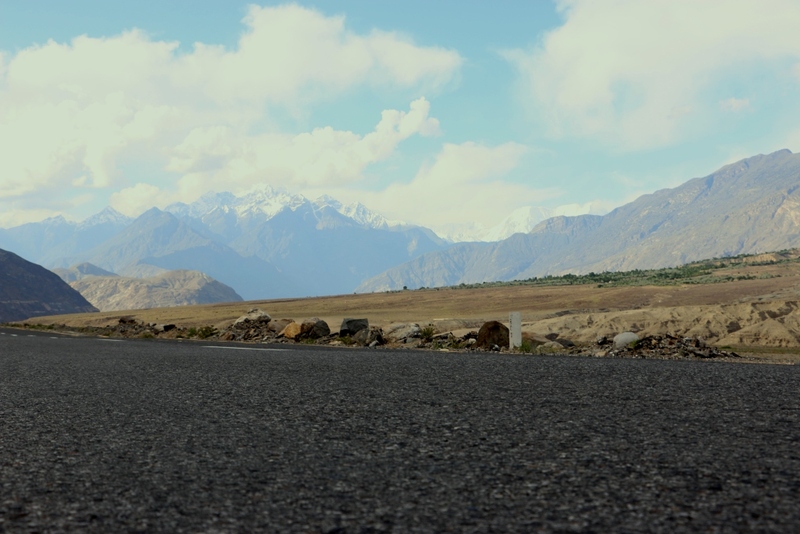 The road to Gilgit. Late evening, 20 degrees and no traffic on election eve. While you have been playing hide and seek with snow capped peaks post Dasu, once you get on the new high way, a few things happen. Its getting late in the evening and the weather is more bearable. Given our run coincided with elections in Kohistan there is hardly any traffic. The metaled road has put an end to the travelling dust devils that have accompanied us for the last four hours. 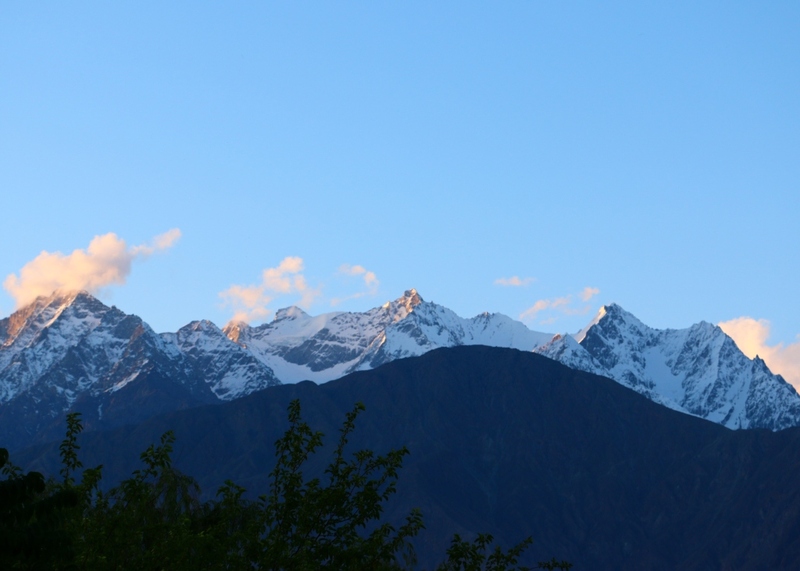 And you can now finally appreciate the peaks around you on the road to Gilgit. One after another you cross viewing points. Nanga Parbat, the junction of three mountain ranges, the merging of two rivers (Indus and Gilgit) and a short tunnel that opens up to a scene from Star Trek Insurrection. Grey mountainsides and river banks losing out to an invasion of green. Splashes of harvested fields extending into tendrils of lush trees that reach all the way out from the river bank to the laps of mountainside. You have time to make a few stopovers. Break out the lens, step on the road and shoot. 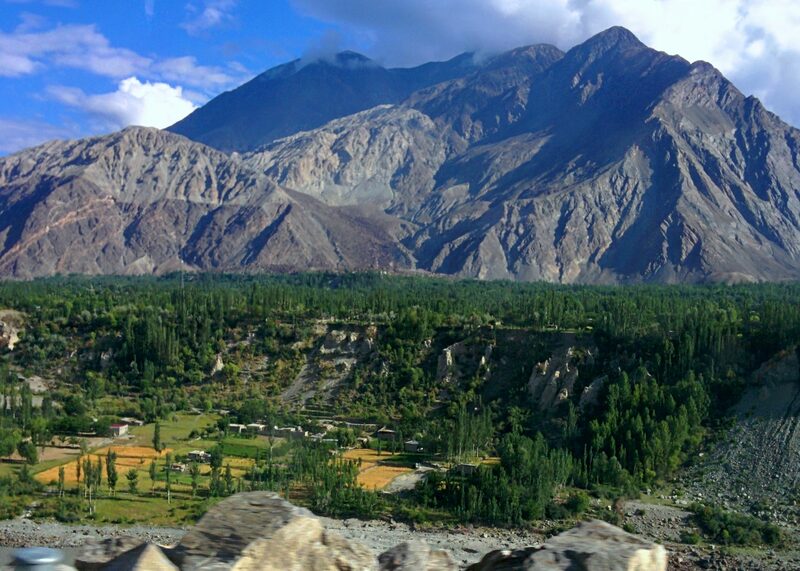 That is Gilgit Baltistan first impression. Not the Raikot bridge, nor the Pak China highway. Jade mixed with grey. 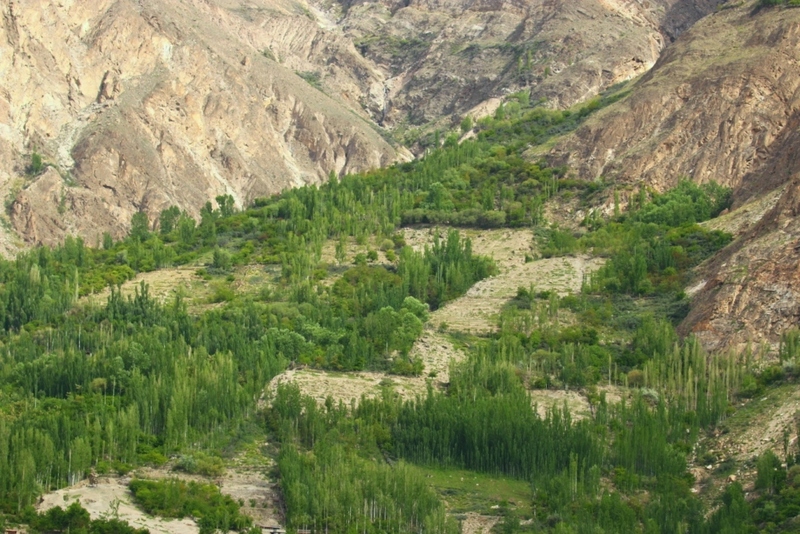 Alive, thriving and beating down dreary Kohistani cliffs with its own concoction of life. 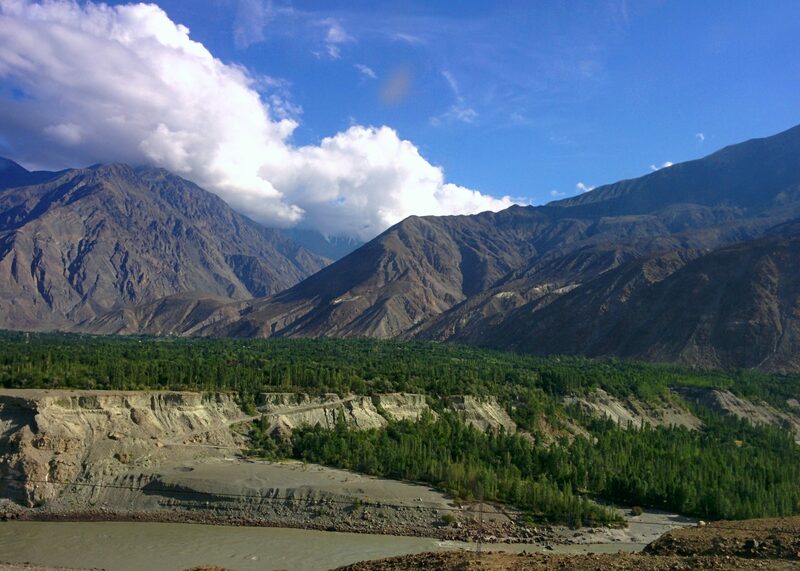 Before you know it you have crossed intersections where bridges, new and old, lead to Skardu and Hunza. Up next are the farms and the cantonment at Jaglot. Golden wheat fields against Kohistani mountains. Late evening Gilgit is pleasant. The heat is a distant memory, the city has grown from what I remember from two decades ago. There are road works at the entrance and election banners everywhere. We make our way across the Cantt, past the football stadium into a slim rising lane. On one side are small shops and stores, on the other is a wall paved with slate and stones. As we cross over the barrier and step out of the van, we finally arrive at the Gilgit Serena. Two days and just under six hundred kilometers later, the journey is half way done. Tendrils of green reaching out all the way from the river bank to the mountainside.